Although civilization in Peru apparently began before 9000 B.C., it was not until 1940 that archaeologists began for the first time to unearth the secrets of this great pre-Columbian civilization. Subsequent archaeological excavation has revealed buildings with construction features similar to those of the pyramidal structures still extant in Peru. 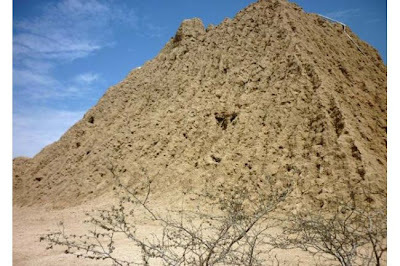 These early pre-pyramids were probably built around 1300 B.C., some 1500 years before the erection of the enormous and magnificent Peruvian pyramids of approximately 200 A.D. The great and rather sudden cultural advances which occurred around 1300 B.C. seem to have coincided with the appearance of the highly developed Chavin civilization whose influence is thought to have been spread by the vogue of a new religious cult. This civilization, which is named after the ceremonial center situated at Chavin de Huantar in the northern Peruvian highlands, close by the Maranon River, is probably the foundation stone on which other, later Peruvian cultures were built. According to Peruvianists (archaeologists who are concerned exclusively with Peruvian excavation) the site at Chavin de Huantar is the largest and most important of the few typical sites known to us. There is speculation that' the site’s stone buildings, containing many rooms not well suited for habitation, possibly comprised a ceremonial center much like the Mayan ceremonial centers, also composed of stone buildings, in Central America. Unfortunately, this site has never been completely investigated. Because of the stones and other debris which filled many of the rooms and galleries of its most important building, archaeologists were unable to fully explore the structure or to make a detailed plan of it. It now appears that further investigation may be impossible, since the Chavin site was almost completely inundated by a massive landslide in 1945. However, archaeological exploration prior to 1945 did yield the information that the Chavin complex covers an area of over 800 feet and is completely landscaped. Because of its highland location, the ancient complex was untouched by such natural destructive agents as tropical vegetation and harsh drifting sands. The sunken courts, raised platforms, terraces, plazas and stone edifices, all oriented to the cardinal points, remained virtually intact, eroded neither by time nor nature. The most impressive and well preserved of all the buildings at Chavin de Huantar is the Castillo, or castle, which far exceeds the other structures in size and importance. The Castillo is an immensely complex building, seemingly prepyramidal in structure. Its base measures 245 feet by 235 feet and is, like the base of most pyramids, almost square. It stands approximately 45 feet high; its outer walls slope slightly inward toward the top and are set back in several narrow terraces, highly reminiscent of the Egyptian step Pyramids. Remarkably advanced in architectural concept, the castle was obviously well planned before construction, and was equally obviously built by artisans of considerable masonry experience. The interior of the Castillo has many of the features of the famous Egyptian Pyramid. It has three floors of dry stone masonry with ventilating shafts running horizontally and vertically. So well planned and constructed were these shafts that they still provide fresh air for the interior of the castle. The huge thick walls were built from split stones and are filled with rubble. The outer walls are surfaced with large, rectangular finished stones laid alternately thick and thin. The interior has a typically pyramidal labyrinth of walls, galleries, rooms, stairs and ramps. The galleries are about 3 feet wide; the rooms range from 6 to 16 feet in width. Both rooms and galleries are less than 6 feet high and are of less cubic area than the walls and remaining masonry. There is no lighting except that afforded by the ventilating shafts. The only exterior opening is the main entrance, which is reached by a stairway of cut rectangular stones. Another smaller site built in the pre-pyramidal architectural tradition of Chavin is at Wilkawain, near Huaraz, in the northern highlands of Peru. The Wilkawain complex consists of a stone temple and several one- and two-story stone houses. The temple is a small replica of the Castillo at Chavin. This minicastle measures about 35 feet by 52 feet and, like the Castillo, has three stories of interior ramps, staircases, galleries, rooms and ventilating shafts. Each floor contains seven principal rooms, larger than those of the Castillo, measuring 7 by 22 feet wide and over 6 feet high. The roof is gabled with great slabs placed on a slope, and is covered with stones and dirt in such a way as to produce a domed effect. This castle is not as famous as the one at Chavin As Huantar; like its better-known namesake, it has never been fully explored because of the ston&_4md other debris which completely clog some of its rooms. The Chavin culture spread throughout Peru and prospered for several thousand years. During this time a religious cult arose which required community erection of temples and other religious structures. The most prominent of the deities to which the cult paid tribute was a feline, a puma or jaguar, whose name is unknown to Peruvianists. Also unknown to the experts is the exact purpose of the complexes at Chavin and Wilkawain. It has been suggested that the Castillo was a shrine to which pilgrimages were made from a large surrounding region. Another theory is that the complexes were centers at which the entire population gathered on specific occasions, such as ceremonial celebration days or market days. The growth of the Chavin culture seems to have halted, as abruptly as it started, some time around 300 B.C. The culture of Peru then stagnated for about five centuries, until approximately 200 A.D., when two new cultures appeared almost simultaneously. These two civilizations, that of the Moche on the northern coast of Peru, and the Tiahuanaco, or Wari-Tiahuanaco, in the southern highlands, seem to have emerged virtually full-blown; they both reached the height of their magnificence by approximately 600 A.D.